More explanations about the dataset can be found in the Gobbi book. This dataset is pretty small (74 rows), so we’re not in the realm of Big Data. Can we still try to make meaningful predictions about the species? Let’s find out! We are going to use R and JAGS to build a Bayesian model for our classification task. The model is heavily based on the excellent “Doing Bayesian Data Analysis 2nd edition” by John K. Kruschke. If you can, get this book! Let’s import some packages into R and read our data. Please, install JAGS on your machine if you want to follow along. Our dataset contains 74 rows with 7 variables each. We are going to answer one question: Given Flea Beetle measures what type of specie is it? How does the features in the dataset correlate to each other? It looks like there is pretty good separation between Heptapot and the other 2 species based on aede2 alone. tars1 shows paints pretty similar picture. How about the species distribution in general? Looks ok, with lead to Heikert. Let’s not forget that our dataset is pretty small though. Now, let’s shuffle and split our data into training and testing datasets. We’ll convert the species into ints as well. You should try to understand that bottom to top. yiy_iyi​ is what we are trying to ultimately predict. It is a categorical distribution. 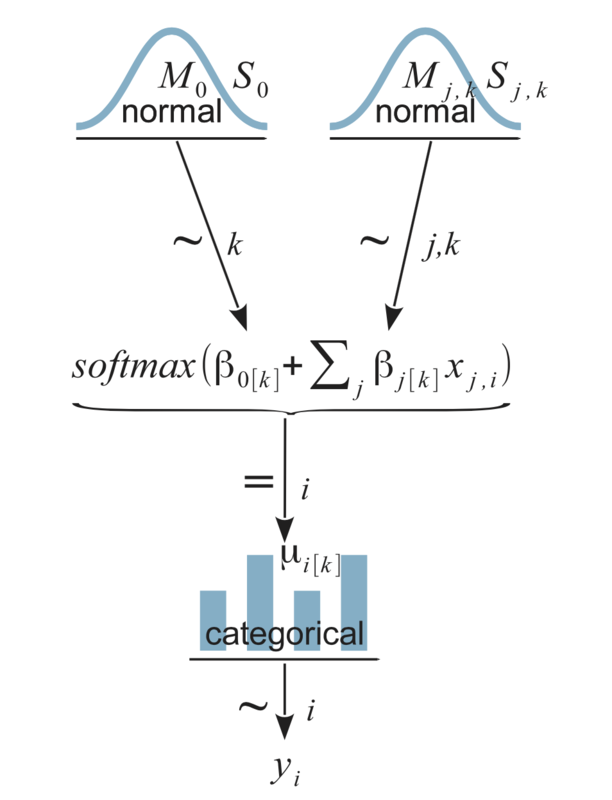 Then you move to the next level (up) where the softmax is defined and finally our normally distributed vague prior distributions. Now for our model definition. It is defined in JAGS. Almost directly taken from Kruschke’s book. So it is a string in R. First, we will standardize our input X for both training and testing data. Then, our yiy_iyi​ is defined as categorical distribution (using dcat) that depends on our data and vague normally distributed priors. We compute yyy for our training and testing data within our JAGS model. Let’s glue up everything together using runjags. We create a list of features (flea beetles measures) who will be used for fitting the model and the species column which we want to predict. n_chains = 4  # because JAGS has only 4 rng's. n_chains = 3  # save 1 core for other processes. First, let’s see if our model has found a fit? Here are the traceplots for the beta parametres (our priors) in our model. So, is our model good? Short answer is - no. First, let’s find all simulation results (columns in the result matrix) for our test data. And pick the most frequent value (MLE) in each column for our prediction. That sounds pretty bad. Can you improve that with another model? Let’s have a look at a specific prediction. The main advantage of our Bayesian model is that it gives us a posterior distribution for each prediction. Think of it as a representation of uncertainty of the model’s prediction. You made it! Well, kind of… Most probably you learned a lot, though. Considering the size of our dataset (and that of our test data) it’s pretty unclear how well we actually did. However, that uncertainty is directly baked into the model. You can predict and roughly know how wrong you might be no matter how small/big your data size is. That is truly powerful.